Curran provides expert applications of high functionality coatings to provide a protective barrier in corrosive services. Curran has the expertise and discipline to meet rigorous client specifications, and the capability to bake cure any organic polymer. 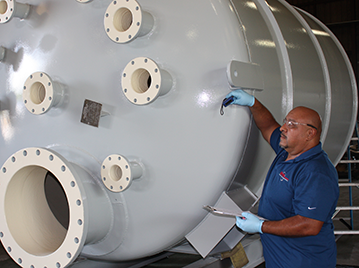 Our gas fired convection oven can accommodate bake curable coatings to 750F; the oven can accommodate pipe to 45’ L, vessels to about 80” diameter. Contact Curran to discuss your service conditions and specification parameters; we have application experience using all 2-part novolac, vinyl ester coatings, bake catalyzed coatings – phenolics, PFAs, PTFE and FBEs. Curran 1200 – A sprayable two part (100% solids) epoxy coating designed for high temperature immersion service in water and process streams (365 F, 185 C). This coating is an organic/inorganic hybrid, can withstand multiple cycling and steam out events subjected to process equipment. Ideally suited for vessels, tanks, waterboxes; temperature resistance 365 °F (185 °C) qualified immersion services. Curran 1500 – A hybrid paste grade two part (100% solids) hybrid epoxy coating designed specifically for high temperature immersion service in water,hydrocarbons, and process streams (up to 365 F, 185 C). 1500 offers excellent cold wall resistance – Atlas cell test: 6+ months DI water at 210 F (98 C); pressurized Atlas Cell Test 60 days DI water at 365 F (185C). Ideally suited for exchanger components; small pressure vessels; tanks, water boxes. Temperature resistance 365 °F (185 °C) qualified immersion services. Baked Phenolic – Dense, tightly adhered thin-film resins, wide chemical resistance for chemical storage and transport applications. Shop applied and baked catalyzed on new fabrication steel substrate, qualified immersion services to 360F. Used for exchanger tube IDs, ISO containers, chemical transport, and pressure vessels. PTFE Non-Stick Coatings – Low coefficient of friction, high-temperature resistance, and superior chemical resistance are the key benefits of these coatings. PTFE, PFA, FEP and ETFE fluoropolymer resins are marginally differentiated in mechanical performance but offer immersion resistance up to 500F. Applications for pressure vessels in corrosive services, exchanger tube IDs, exchanger channels, pipe ID, and valve bodies. StreaMax™ – A Chemours recommended material for Heat exchanger applications Chemours recommended material for Heat exchanger applications, shop applied fluoropolymer; bake catalyzed, uniform adhesion; reduces surface roughness and drag, low friction coefficient. Excellent non-stick and product release, for some services up to 500F. 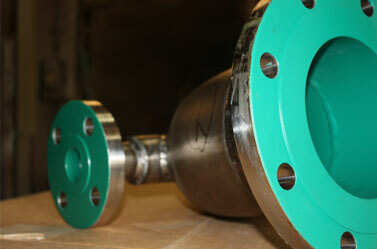 Applications for exchanger tube IDs, pipe ID, and vessels. TSA – Thermal combustion sacrificial coating using alloy wire, thin layer of alloy slows corrosion, protects from galvanic attack. 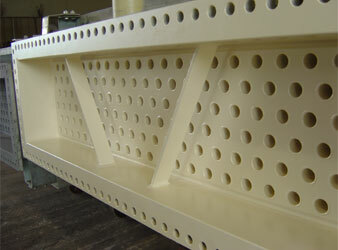 Sealers are available to extend the service life of a thermal sprayed coating. Curran has experience applying a number of alloys to end client specifications: aluminum, stainless steel, nickel/chrome/moly alloys, zinc/aluminum alloy, and surface hardening materials.